Mangaluru, May 26,2017: At Mangaluru central rail head, three platforms function, plans are a foot to construct an additional platform at Mangaluru Central Railway Station in order to clear heavy traffic, said Dakshina Kannada Lok Sabha MP Nalin Kumar Kateel at a phone-in program organized at Mangaluru All India Radio station on May 24, Wednesday. 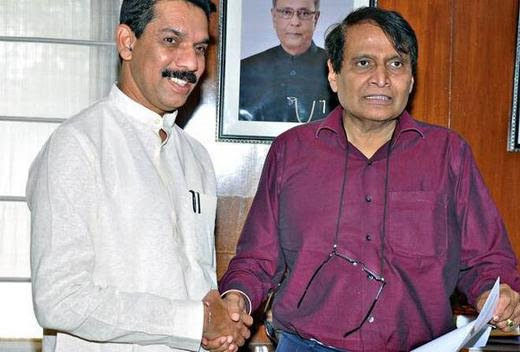 He recently met union railway minister Prabhu too. Mangaluru Central has been functioning with only three platforms from the past near 3 decades, it connects major stations in the country. MP Kateel said that efforts were on to run the Gomateshwara Express from Mangaluru Central instead of Mangaluru Junction. He also assured that the passenger train between Byndoor-Mangaluru-Kannur would restart soon. Meanwhile, authorities are also trying their best to start Mahalakshmi Express between Mangaluru and Hubballi, he added.